Over the last 11 years, I’ve watched so many in the genealogy world wring their hands that conference attendance is dwindling, that societies are shrinking, and that small companies with innovative ideas can’t make it in this market. “Why doesn’t the rest of the world understand how wonderful genealogy is?” they say. Well, over the last couple of years, RootsTech has delivered the genealogy community an amazing gift—BEGINNERS WHO ARE CURIOUS ABOUT WHAT WE DO. FamilySearch has done what it came here to do, which is to unlock the Mormon market, a market that is innately vested in family history but doesn’t quite know what to do about it. They’ve also unlocked a huge amount of the general market. There was an incredible range of people at RootsTech again this year. Young, old, experienced, novice, and those who *think* they know how to do genealogy. Some of them might have been a little quirky. Some of them might not have been your ideal client. But ALL of them were interested enough to show up. The genealogy community now has a choice. I submit to you that if we reject these newcomers to our community, we do so at our own peril. To discard them will cause your [society/organization/company] to wither up and die. Like quilters’ conventions (which draw huge crowds to a very complicated craft) we need to embrace all levels and all kinds of people at our events. Consumers, societies, companies, vendors, and attendees all need to REALLY embrace them. What can you do to make them feel welcome? Quilters’ conventions are a great example I’ve talked about in the past. At quilters’ conventions, professionals love to share their ideas with newcomers. If we want to survive, I think we need to make this work. It may take a new focus or some updates to our business models, but how else will we bring in new business? So, did I hear these comments right? Were these people actually rejecting a crowd of 22,000 people who showed up to find out about what we do? I’m hoping I misunderstood. I hope I just wasn’t tuned in to the overwhelming joy that surely must have been humming around that hall. Personally, I’m in—I’m all in. I am happy to reinvent, make accessible and do whatever I can to make every one of those 22,000 learn about how exciting family history is. Like I said in my earlier post, if I can offer swag, load up on bags of candy, invent games, and make this experience inviting so that the beginners and youth come back next year with a little more knowledge and some excitement to come to the conference again, I’m all in. I’ll say it again: If, as a genealogy vendor you felt like this wasn't your market, you need to make it your market. New market is good. Let's grow! I must have had a busy exhaustion fog blocking my hearing. Let’s hope so. I love to share genealogy ... whether it be with beginners, experienced people with brick walls, just talking and celebrating our common interest! I found Roots/Tech fascinating and did notice while chatting with many of the attendees that they were newbies! But, isn't that wonderful! I think it would be very exciting to RootsTech started moving around the nation though ... not just staying in Utah! How many more people can be exposed to genealogy and join us!!? Appreciated your comments! Those 22,000 people didn't just show up - they paid good money to attend and learn. I'm an amateur who has been lucky enough to not have encountered the elitists you heard. The good news is that the elitists make room in the marketplace for new pros who are still enthusiastic and eager to share their knowledge and expertise with the rest of us. Well said!! As more of a beginner myself with family history compared to those with years of experience I sometimes feel the "right and wrong" way to do stuff is pushed like the genealogy police are going to arrest me. I don't do everything perfectly or the official, my folders are not sorted by family names however with technology I can find any copy of almost any source document I have, when on the road, in a few seconds. Folders at home don't allow this. Bring on the young, the new ideas and we will all be better off. I made a point of presenting my session to not only talk about one-name studies, but also to encourage surname research. If all you do is find out the meaning and country origin of the surnames in your own family that is a GREAT start, and for some a great finish. We need to give people a sense of enthusiasm about learning their family connections - with DNA studies, ethnic studies, and learning about the history, geography and culture of their ancestors. Understanding your past is one of the keys to who and what helped shape who you are today. I also worked the FGS Society Showcase on Saturday and it was about answering the questions and being where the questioner was at and addressing what s/he wanted (not selling my society). Opening up some avenues (where to find Greek information, how to find out where my ancestor who appears on the earliest USA censuses might come from, how to find out more about Minnesota ancestors) was not about "selling" anything but encouraging people to check out their local and distance societies and some websites that might help. When that spark showed up and someone walked away with some ideas on learning more, it was a great feeling for both of us. As to the conference itself: Can we make improvements? Sure. Should the exhibit hall be open less when sessions are going on? YES that would be a great break for all involved. Do we need to have a bit more diversity? Of course, the question is how to we go about it - something to work on for 2016. Would it be better to have the "big players" spread out in the exhibit hall so people get to all 4 corners and see some of the smaller players? Definitely. And have I provided my thoughts in the reviews/feedback to both FGS and RootsTech? YES YES YES and you should too. But the complaining and snide comments that I sometimes heard are not good and it does not reflect well on the person making the comments. Personally I was thrilled and grateful for the opportunity that RootsTech provided me to be a presenter and share one of my passions (one-name studies and surname research). And the staff, av support and my wonderful room monitor Karen could not have been more helpful - before, during and after my presentation. It was my first time attending RootsTech/FGS and, while it was overwhelming in terms of so much to do and so little time, it was an amazing experience. Kudos to the FamilySearch RootsTech team for pulling it off and thanks to everyone who was there with the attitude of "let's check all this goodness out." It was an experience not to be missed and I learned from some "well known" as well as several "lesser known" speakers - excellent all around effort by RootsTech and FGS volunteers. This year I came to the Rootstech FGS conference. I did not intend to attend any of the sessions on the opening day for FGS as initiially I thought they might not be relevant given that I am not a particularly active member of the family history societies I belong to in the UK because they are not local to where I live. However perusing the classes the day before I decided to attend some of them and ended up having an interesting and thought provoking day. I am going to WDYTYA Live in Birmingham in April and intend discussing some of what I discovered with the societies representatives at the show. As I intend to compare the 2 experiences I will leave further discussion until late April or early May. However the challenges facing societies on both side of the pond are similar and wherever you are the influence of social media needs to be embraced if memberships are to flourish. How we all live our lives today is changing and we need to adapt or we fall by the wayside. Thank you for putting this out here (out there). My first year at RootsTech, on the bus back to the airport, I heard one person tell the bus, how bad Roots Tech was, using most of the same comments you heard. I couldn't even hit the delete key. Good thing the bus ride wasn't too long, but long enough to hear this person rant. Last year, on Saturday, what I saw was a bunch of young people, with all of their energy, exploring what was in the Exhibit Hall. THEY ARE the future. I heard some say, that the kids were there for the free stuff. Ok, that's cool, but they don't have to "get it" instantly. At some point in time, they will pick up where we left off. The expansion of the Families this year was awesome. I am only sorry that my grand-kids "didn't get the memo". I watched DearMYRTLE interact with the "lifestyle" and "mommy" bloggers. It appeared to me, by their reaction, that they were starting to understand what those folks with "blogger beads" were all about. It was great to have the Media Center, large enough so that "we" could just talk, have a conversation. I would suspect that other genea-bloggers learned from the other blogger communities were doing and what they were all about. For me, I intentionally go back to those classes that I may have attended before. Go back to those speakers that I have heard before, because I learn or re-learn bits and pieces of what I may not have "heard" before. I am listening with new ears, listening with different experiences. This year, most of my "spare time" was having conversations with friends, new friends, about our various experiences in search of our family stories. Besides the new technology what we have been introduced to, I think that the themes of the past several Roots Tech has opened our eyes to finding those family stories, to help us move beyond the names, dates, and places and get those stories. Final comment. The reaction to the Innovator Summit was interesting to me. I heard several people say how "low tech" the innovation was. But, I came away with a different reaction. That innovation may be the way that I can get the stories from my 95 year old aunt. I use current technology all of the time. She doesn't. She has a phone and this "low tech" solution might become very handy. Thanks again for posting this so that WE can have a discussion about RootsTech. Thank you for this. You know, even though I've been doing genealogy a few years, I still learn new things from the beginner sessions. And who doesn't need a refresher on best practices for the basics? Of course we complain its too simplistic when they promise to be technical and make us pay for show called RootsTech, and we then find out it isnt technical at all. It isnt RootsTech, its RootsNoobs. If they change the name to Roots for Dummies, wel'll stop complaining about the simplistic level. I have not missed a RootsTech yet. The energy is always uplifting. I heard some of these same sentiments that Janet mentioned. It reminds me of when the internet was just beginning to grow and the genealogy societies said "oh, woe is us -- everyone is flocking to the internet." Well, then, BE on the internet! Adaption and change is how we grow. I have not missed a RootsTech yet. The energy is always uplifting. I heard some of these same sentiments that Janet mentioned. It reminds me of when the internet was just beginning to grow and the genealogy societies said "oh, woe is us -- everyone is flocking to the internet." Well, then, BE on the internet! Adaption and change is how we grow. It doesn't always feel comfortable -- and business plans have to change -- but I would not say it is elitism, Just slow to adapt. I am a professional and I had a wonderful time at RootsTech. I intend to be there again. You got it right! A sapling needs the strength of the other trees to grow. They protect it from the elements and with the mature trees it must fight for sunlight. Without a forest, the lone sapling would die from constant exposure to all the elements. A forest that allows no new growth soon will die and become a wood pile by and by. Weren’t we all saplings at one time in this path of family history/genealogy? We all had strong trees to protect us. Now it is our turn to protect the new saplings. If not the entire forest will die. To Pat, regarding FGS not begin mentioned -- while it's true that they were two separate conferences, they were being held jointly. The press releases regarding the keynote speakers came from both organizations. It seemed a grievous oversight on the part of RootsTech to not even mention FGS after the Day 1 keynote. I, too, heard some voices of criticism. And, it's a shame. Most of the comments were about the crowds. These comments were from Facebook. There were many photos of the large halls showing throngs pushing through. But, that was not the typical day. Those were shots of people leaving the hall where the keynote speakers had just finished, and were on their way to either the expo hall or their classes. It was not like that at any other time during the day. If anyone knows how to handle crowds, it's the LDS church. General Conference is held twice a year over a two-day period. There are five sessions, each with over 21,000 people. There are outdoor church pageants held throughout the US, where nearly every night is filled with thousands. There is order on every turn. Family Discovery Day brought a sense of energy and excitement that I have never experienced at any conference I have ever been to. I didn't see parents dragging bored teenagers through the halls into classes or to look at products. My husband tried to get into one of the classes taught by church leadership, and there were so many youth in there that he couldn't get in. Of all of the places these youth could have been on a sunny Saturday in the middle of February, they decided to be at the Salt Palace listening to talks about genealogy!!! They were in the exhibit hall learning about things at a much faster rate than I am able to learn. One young man sat with his mother for nearly three hours scanning over 3,000 photos they had brought in two shopping bags. He showed me how the scanner worked, some tricks to loading the photos correctly, and was patient with me. I loved every moment! One person commented that they wondered if these young people would actually stick with it. If they receive the encouragement and appreciation from US, there is a greater chance they will. Other comments: 1. The classes were below my level. 2. The classes were above my level. Come on. It was a good conference. There were good people. Let's look for the good, and help out if we think there is something that could be improved on. One big question is -- whose job is it to help beginners transition to intermediate and advanced genealogists? One way to measure whether or not the beginners who have come to RootsTech in previous years are progressing and becoming better genealogists would be to get numbers of how many previous RootsTech attendees purchased the FGS add-on to receive more advanced training this year. How were the FGS figures this year? 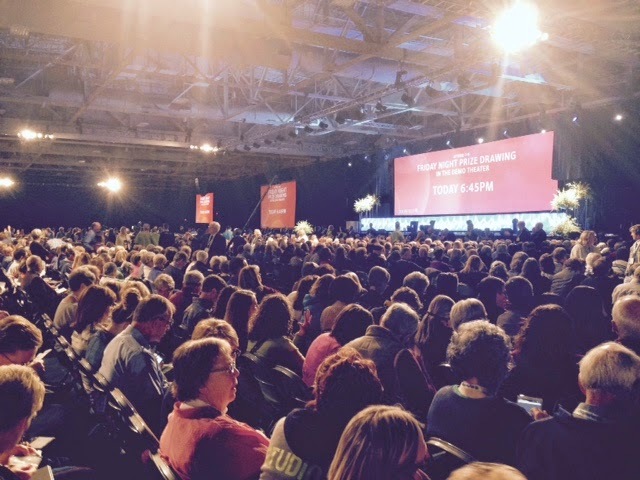 Do we know what % of the FGS attendees were self-described beginners who had attended RootsTech in the past? Are the RootsTech newbies being encouraged to develop further skills? Or is the jump from beginner (RootsTech) to advanced (FGS, NGS, etc.) too steep of a climb? The Mormon newbies, once they get 'engaged,' will quickly realize that if they wish to push the pedigrees back further than the genealogies they inherited from their grandparents, they will need the type of advanced training available at FGS, NGS, institutes, etc. I'm not seeing many people or organizations stepping in to fill the void needed to move someone from (A) adding a photo to Family Tree to (B) using the GPS, DNA, and the FAN club to solve a genealogical problem. I have been doing family history for 27 years and am still an amateur. For me it is not an academic pursuit but a fun albeit serious hobby. I have been to four out of five Rootstechs, the greatest genie show on earth, and love them mainly for the people that I meet from the old pros, to enthusiastic youngsters and beginners of all ages. Sure there were things at Rootstech that annoyed me but I voiced these in my evaluations, there is always room for improvement. I think the organisation of the event was superb. I suspect that most of the people who attend Rootstech are like me. They do not worry about the correct way to cite a source, they just record enough detail to lead someone else to find that source. Their methods of organisation may be haphazard like mine but they are having fun while learning about their ancestors, recording their lives for posterity and sharing their stories. Their methodology may be unique like mine (not adhering to one of those fat expensive texts) and supported by information skills developed during years of life, work and tertiary study. I think that more of the 22,000 people who crowded into the exhibition hall at Rootstech on Saturday during breaks were amateurs like me and probably not (unlike me) society members. Curt Witcher's statistic, shared at FGS Society Day that between 82-90% of people doing family history don't belong to a society keeps ringing in my ears. Perhaps the naysayers should stay away and let the majority indulge in the joynealogy that is Rootstech. As a newbie to RootsTech, I had a GREAT time, I learned so much from presenters I'd never heard before. I had the chance to explore the new programs etc on offer to us. As a professional administrator I can't help but look at what could be done better, but seriously, for the numbers involved, there was little to complain about. I'm sure I got fitter going from one end of the Salt Palace to the other for talks. We need to be open to new experiences yet also educate people. Making it fun is more likely to achieve that, I'm sure it will remain a remarkable memory for me :) Ilved meeting people I'd only known onlne. Amen Janet!! I LOVED the large crowds. It made my heart happy to see all the youth. I have been doing genealogy for almost 40 years. Then it wasn't what it is now. I learn something at every class I take (genealogy or quilting). I love to help others newbie or otherwise. I learn that way also. I'd probably get more of my research done if I didn't get the same happy dance for helping others find what they are need as it does to find my own. You have to remember if it wasn't for new people becoming involved, genealogy would still be done using paper, pencils, letters, and trips just like we did 40 years ago. This is much better. So nurture those newbies! We need them as much as they need us. Nathan, you hit the nail on the head. Every conference or institute cannot meet the needs of every level researcher. We must create an engaging path to move them through the levels. But whose job is that? I don't have a good answer. I appreciate your sentiments about there being different entities that fill different needs. There will always be a need for instruction at all different levels. I think with this influx of new family historians, there is a great opportunity for anyone who can help transition them to a higher level. And eventually as they progress this will lead to stronger programs at higher levels. My plea here though is that we need those higher level genealogists to stay engaged with the beginners and help them learn--and be patient with them even if they don't choose to learn as fast as we'd like them to. Let's try to make this an easier climb for them. I hope we can be an inclusive community for all levels of genealogists. Besides creating a vibrant community, you never know who might have that trunk in their attic that you need. Janet, you're right about advanced genealogists staying engaged with new researchers. How sad! I admit, I've been disappointed by the lack of intermediate and advanced classes the last year or two, but I LOVE the energy, and I love seeing so many people, especially youth, being introduced to this amazing craft! I loved that FGS was part of it this year, supplying those more advanced classes, but I agree they didn't do a very good job of really integrating the two. I also felt bad because I overheard several of the "beginners" who had a bad experience because they'd been intimidated by the "experts" and their casestudy examples of spending years (decades) working on one person. Others that the genealogy professionals are, generally speaking, rude and stuck-up. We definitely had a lot of work to do. Oh I see Janet. Thanks for the clarification. Yes, I agree, we definitely shouldn't turn away the beginners. I loved reading through all these comments, and I personally LOVED what RootsTech did!! So so inspiring and I'm so happy that they're helping people in greater and greater numbers, especially young people, to get acquainted with family history. This acquaintance is often all that's needed to inspire some of our great degree-seeking genealogists down the road. And those who don't go that far are blessed by whatever they pick up. While I did not attend the conference in person, I did stream many of the sessions offered and have read each and every comment posted above. I have been doing genealogy since 2006, and if I use all my fingers and some of my toes, that comes to 14 years. Sometimes I am a beginner, and sometimes I am an intermediate researcher. I am always humble in the presence of knowledge and always learning. Genealogy, like happiness, is a journey, not a destination. In genealogy, as in life, sometimes we are the teacher, and sometimes we are the student.There is always something to learn - I have attended webinars and conference sessions where I get done and have that aha moment where I realize that I really do know a thing or two! From most of the comments, there is a wealth of knowledge and compassion out there, which is a wonderful combination. Great post and great conversation! I'm glad to know the movers and shakers of the community are embracing newcomers. It also needs to be pointed out that even though this wasn't RootsTech's or FGS' first rodeo, such exponential growth of attendees is hard to handle. I'm sure next year will be even better! Mitakuye oyasin. We are all related. Share. Don't covet. Welcome all.